Flagella are small appendage that protrudes from the cell body of some cells. The main role of a flagellum is usually locomotion, but it also has many other functions, as sensory functions. In many biomedical studies, it is of crucial importance to be able to quantify and analyze the motion of flagella under different conditions. The goal of this project was to build a program that extract information on the movement of the flagellum of organism in an automated way. This program was implemented as an ImageJ plugin. Flagella were detecting using a steerable filter. 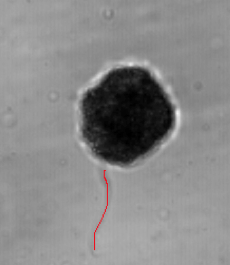 While, the flagella tracking algorithm was developed with an adapted Dijsktra Algorithm. The user has to enter some morphological parameters about the organism. The final output of this plugin is a results table containing the coordinates of the flagella at each frame. The analysis of these positions could provide a great tool for biologists to help them correlating flagella undulations with body displacement.